Tuesday, July 22: The prairie is approaching the peak bloom period for the summer with the arrival of such typical flowers as Showy Tick Trefoil Desmodium canadense, Culver's root Veronicastrum virginicum, Gray-headed Coneflower Ratibida pinnata, Black-eyed Susan Rudbeckia hirta, Bergamot Monarda fistulosa, Flowering Spurge Euphorbia collorata, Dense Blazing Star Liatris spicata and Virginia Mountain Mint Pycnanthemum virginianum. Wednesday, July 9: The 10th annual Windsor butterfly count was held on Saturday, July 5th.. The results are now posted on the butterfly count page. 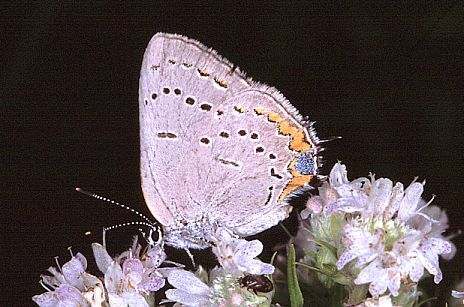 Forty-four species of butterflies were recorded despite cloudy conditions and rain in the morning. Emerald Ash Borer beetles have been conspicuous on the trunks of green ash trees since July 3. Both mating and egg laying have been observed on a daily basis. The ash trees by the edge of the centre's parking lot are a good place to observe these beetles. Sunny afternoons seem to provide the most activity.